A number of families have been struck off the children’s allowance list after being told that the department did not have their full details. A screenshot of an SMS sent to parents by the Social Services Department. 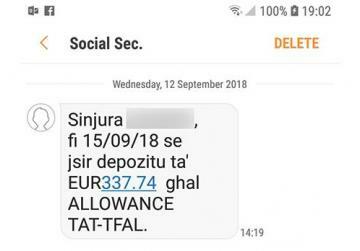 Irate parents told Times of Malta that they were not even informed about this and only realised that the December instalment of the children’s allowance had not been deposited when they overheard other parents speaking about it. “I did not even realise until I overheard parents speaking about it outside my daughter’s school and wondered what had happened to my allowance. I usually receive an SMS a couple of days before informing me that the amount will be deposited in my bank account. I last got it in September but I received none in December. But with the rush of the festive season, I did not give it any thought,” one father told this newspaper. He explained that he called the Social Services Department several times, never managing to get through. On the fifth attempt and after almost 10 minutes listening to music, an agent on the other side of the line said that a letter had been sent to the old address and that because he had not replied to the letter by the given date, he had automatically been struck off the benefit. Asked how he could benefit once again, the agent said that he needed to apply from scratch, and that he and his wife had to fill in a form in person at the Labour Office, attaching also their FS3s. The same happened to several other parents, who were told they needed to apply from scratch for the children’s allowance they are due. Questions sent to the Ministry for Social Solidarity about the matter remained unanswered by the time of writing.